Tigerlilly Quinn: Think I'm a little bit in love with you.. Happy Valentines day you lovely people! I hope your days are spent with people you love, be it your partner, friends or family. As it is a day of love I would like to share the story of how me and Tom got together. We met at a comedy gig, I spoke about planetariums and he made me laugh. A few days later a mutual friend forwarded me an email from Tom to her ( I wont share all of it ) It stated that he thought 'I was lovely and wanted to marry me. We would live in a marshmallow castle under the sea where i would make earings for fish ( even though they dont have ears ) the business would fail and we would lose our castle but it would be ok because we would have each other'. - How could i resist! Later we met again and went on a few dates, by this time we were falling for each other but I already had plans to move up North. We met the day before I was due to leave, he showed up with a tourquoise unicorn and a marshmallow castle..i knew i was making a mistake leaving.. I left and we spoke everyday, we wrote each other letters and sent gifts. six weeks later I moved back to be with him. We have been together for one year, two monthes and ten days and I hope we will be together for the rest of our days. "Your friend Fritha is lovely. I would like to marry her and live under the sea in a castle made of marshmallows. She would make earrings out of shells to sell to fish and I would support her even though fish don’t have ears. 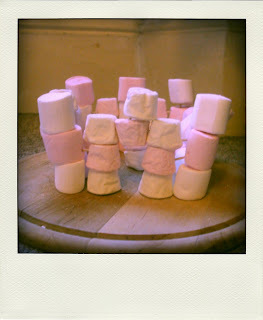 Obviously the business would fail and we would lose the marshmallow castle, but we would be happy, because we would have each other."